You think everyone is who they say they are? 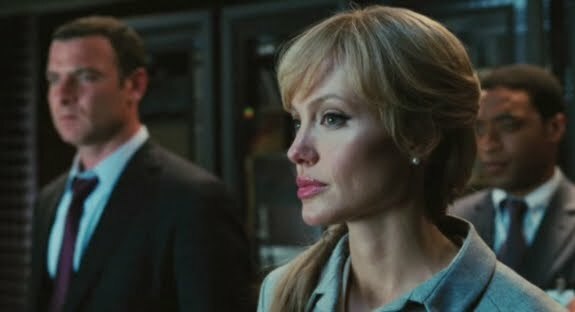 Sony has premiered a full theatrical trailer for Salt, starring Angelina Jolie and directed by Phillip Noyce, their big spy action movie that's hitting this summer. I don't expect this to be my favorite movie this summer, but it looks like an incredibly, intense and exciting movie to say the least. Jolie was born to play roles like this. Salt is directed by veteran Australian filmmaker Phillip Noyce, of Echoes of Paradise, Dead Calm, Patriot Games, Clear and Present Danger, The Saint, The Bone Collector, and Catch a Fire previously. The script was written by Kurt Wimmer (Equilibrium, Street Kings, Law Abiding Citizen) and Brian Helgeland (L.A. Confidential, Conspiracy Theory, The Postman, Mystic River, Man on Fire, Taking of Pelham 123, Green Zone, Robin Hood). Sony is bringing Salt to theaters everywhere on July 23rd. I'm ready for this to hit theaters now. What about you? Wow! Thats look great. I love your page to. I must say I hope to see this movie. Its like watching the fugitive or one of those kind of movies.